They’ve had a smorbasboard of different foods this spring. An acquaintance of a friend keeps buying 50 lb bags of various plant materials, hoping to use them for dye. They don’t quite work out as he planned, so we are the beneficiaries of 49 lbs of beet pulp, 49 lbs of ground alfalfa, and a 5 gallon container of liquid molasses. 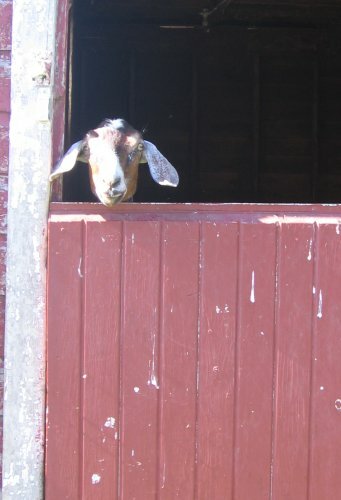 When you are a goat, it’s all good in small quantities! The cherries are late this year, but they are here – a welcome sight after last year’s late threatening frost and this summer’s rain. The weather service announced that the first six months of 2008 were the wettest first six months of the year on record – we’ve never had a Jan-June stretch of wetter weather. This is a North Star cherry tree – the other variety – Montmorency still has green balls for fruit. 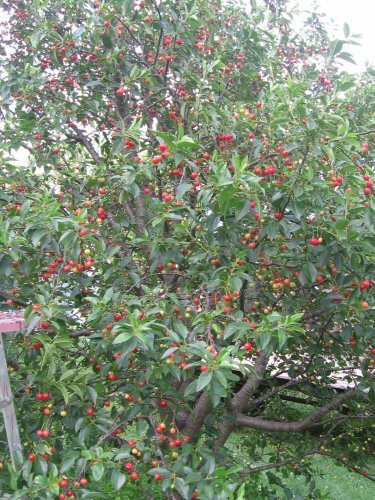 This tree has already been picked a couple of days and has plenty more cherries ready to pick. These cherries make great pies and jams. 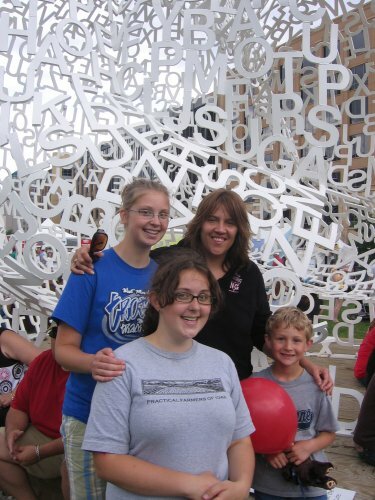 Since Aunti Julie was here this weekend, we went to the Des Moines Art Fair. 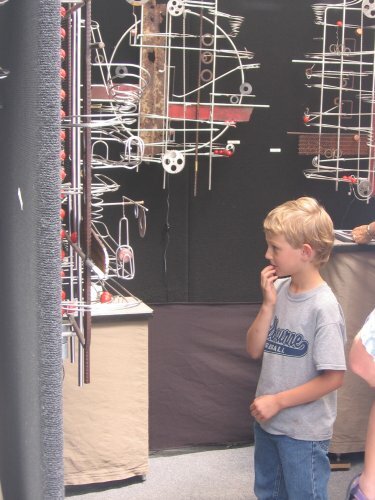 Here Martin is amazed by a contraption that moves balls around a series of loops, falls, twists and turns. 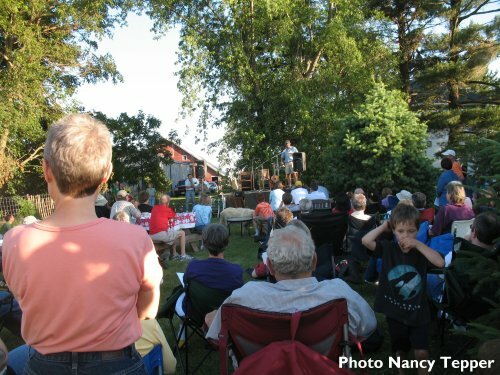 You might recognize this guy from the July 21st Wind Turbine Dedication – one week at high hopes gardens, the next at the art fair! The neices and nephew with auntie! 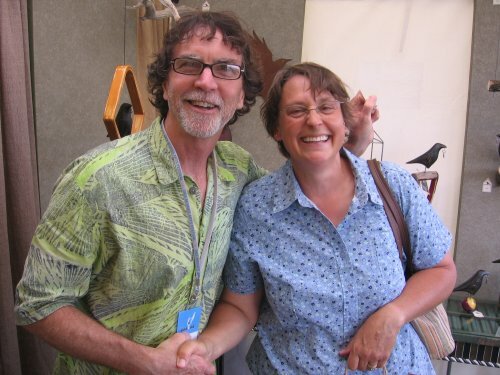 Linda seldom sees something that strikes her fancy – this artist, Mark Orr, had a series of ravens bearing keys in their mouths and Linda could not resist! 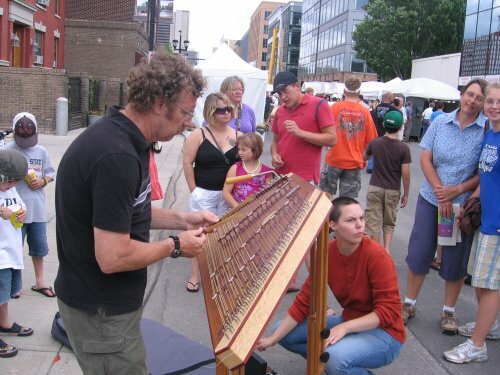 Here she is with the artist. 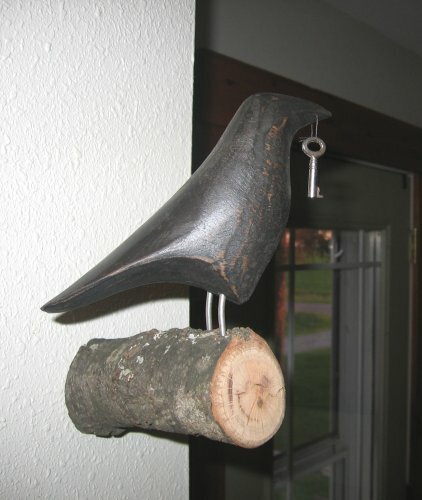 Here is the raven on its new perch in the living room near the front door. One of the symbolisms of the raven and the key is the opening of doors and the welcoming of positive change into our lives. The loss of our local chicken locker threw us for a loop this year. Instead of driving 20 minutes away and taking the chickens with us when we left, the closest other locker is an hour and 20 minutes away and we needed to take two trips, once to drop them off, then another to pick them up the next day. The chicken raising business is perhaps the riskiest and least profitable enterprise we do. Feed went up 25%, butchering cost doubled, and we used $70 in gas just to drop off and pick up the chickens at the locker. I dropped them off on Wednesday and because of the longer trip to locker than usual and heat while we were waiting in line to start, we started losing chickens waiting in line. I think we lost seven of the largest ones as they are most prone to overheat. Another person waiting with us had the same problem, but we were able to move about 50 of her chickens from her horse trailer to the empty box of the pickup. The next episode was when Linda picked them up the next day – a storm had moved through the town before Linda arrived and power was out at the locker. The locker owner understandably did not want to open the locker doors with the power off, because he wanted to keep as much cold in the locker while the power was off. So more waiting while waiting for power to be restored. We dropped about half the frozen chickens off with customers and kept the rest as a 50-50 mix between frozen and fresh for ourselves. 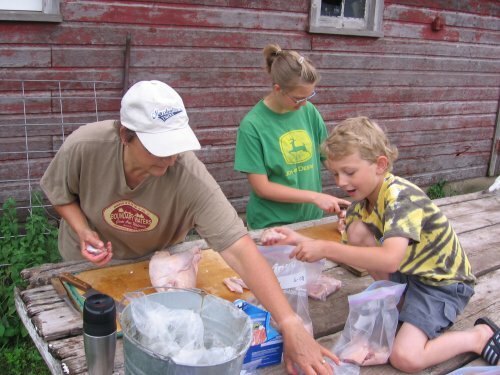 So this morning Linda and Emma worked on cutting up the chickens in meal-sized portions for quick winter meals. We’ve been debating doing on-farm butchering, and the cost associated with the locker, the gas to drive there and the eight hours of time driving and waiting at the locker (not counting waiting for power to be restored) push us to think about that direction. Also check out the last thingamajig answer. Put your guess in a comment below. 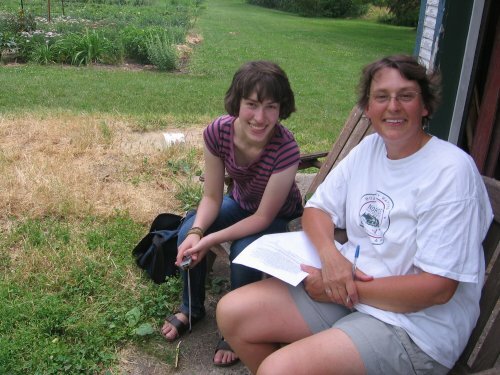 Linda gave another interview today, this time to a Senior at Grinnell College doing a study on the role of females on family farms. They must have had a good time since I could hear them laughing in the distance while I puttered around with Martin. This week we had a bee swarm on the farm. Bee swarms are fascinating. 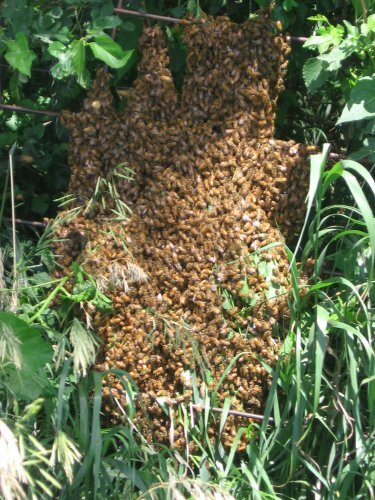 They occur when the hive is successful and needs to split or reproduce. 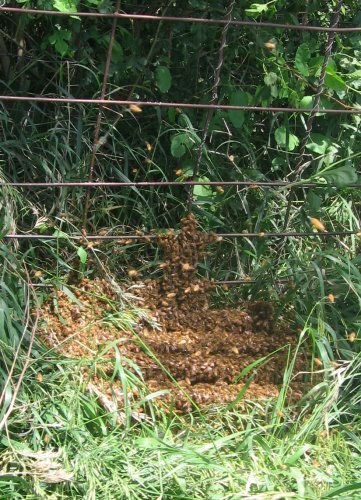 We happened to see this one swarm on a fence on the boundary between our farm and the adjacent corn field. The bees, all 35,000-50,000 of them, are fairly docile as they are homeless while the scouts are out looking for new lodging. We called gj and she ran out and got a “nuc” or small hive box with some frames that used to contain honey to convince them that this is their new home. Beekeepers love swarms in June, because you can double your hives for free. Here she scrapes all the bees into the new hive box. In this photo, the bees have nearly settled into the new hive while gj is building some new hive boxes for the new permanent hive. 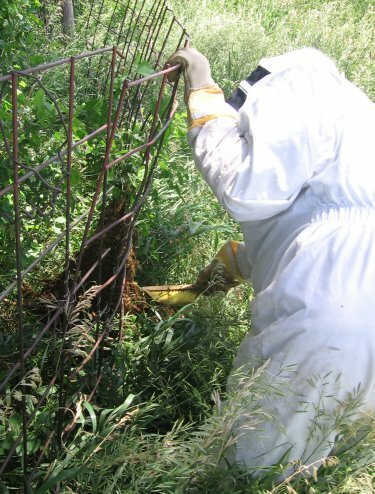 We all know that in games of sport and heart attacks, minutes and seconds matter, well, we found out that is true with beekeeping. As the new hive boxes were traveling towards the nuc box in a cart, literally 45 seconds away, one of the giant field sprayers came down the road and entered into the field despite two people in white suits flailing their arms to attract attention to the driver. The drive into the field literally has six vehicles a year enter it and as it entered the drive, the swarm got spooked and lifted off and headed out across the field. I followed them for about 1/3 of a mile before they got out of my eyesight as they fly a bit faster than I could keep up. If we had left literally a minute earlier or the spray truck left a minute later, we’d now have another hive of bees, but as it is, they are now lost to us. 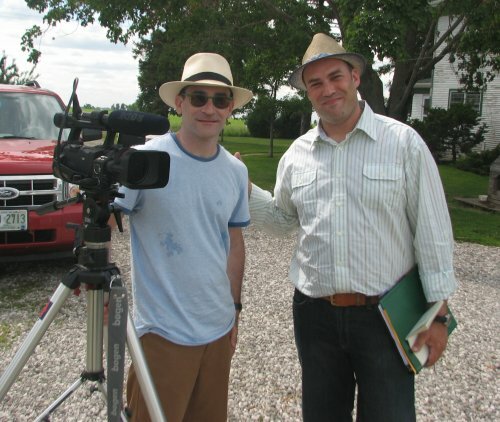 Today we had a visit from a couple of documentary film makers, Nick and Max Cain. Today was a quiet day after the party – tearing down is so much easier than setting up. It was nice to walk around the farm in all its well-keptness and not be prone to weed or fix “one more thing.” I spent some time with the Skystream data logger. 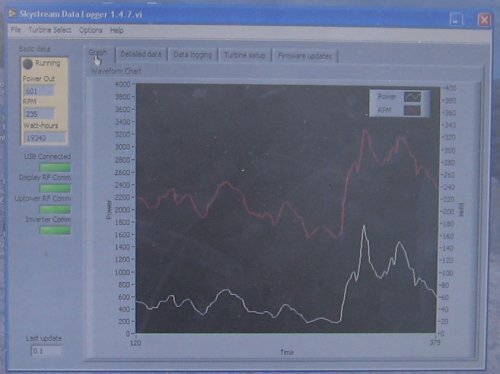 The data logger uses RF to transmit data from the turbine to a laptop or PC. For the geek side in me, it was intriguing to watch the power generation graph while listening and watching the turbine so I could get a sense of how much electricity it produces at different sound/wind levels. Today was the big day – one we thought might not happen. 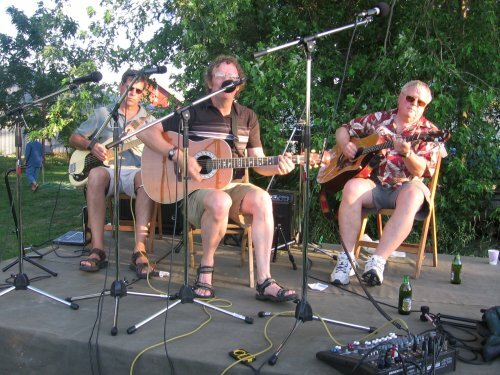 We were very close to postponing the party a week ago in the wake of the flooding and water in the basement that demanded all our time – but we went ahead with the triple bash of wind turbine dedication, 2nd Annual Logan Township Music Bash, and Summer Solstice bonfire. Linda kicks off the dedication ceremony with a welcome and introduction to all the guests, estimated at about 150. 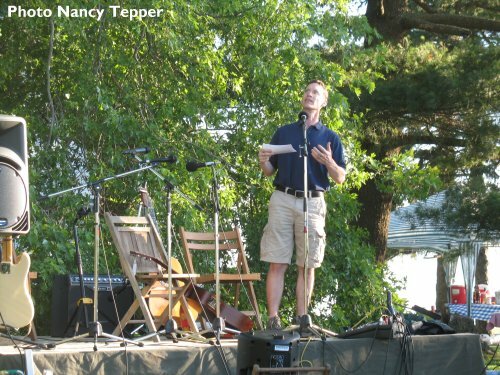 Mark Tinnermeier, President of the Board of Directors of Consumer’s Energy speaks on behalf of our electric co-op, which was wonderful to work with through the entire process. 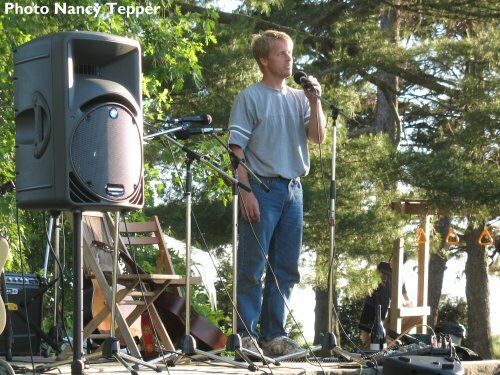 Todd Hammen tells a little bit about his story and the turbine he installed. Todd was so dedicated to getting things up and running and working out any kinks that came along, that he deserved another photo! 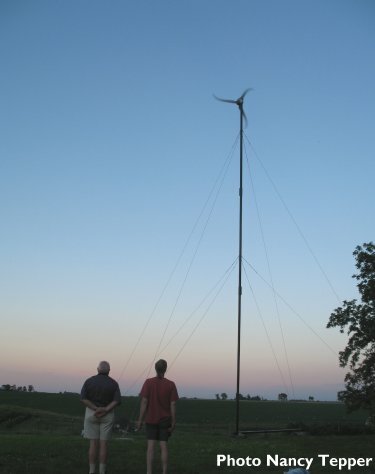 As Brian Eslinger, minister of the Unitarian Universalist Fellowship of Ames, gazes upward to the turbine, he places the turbine into a perspective of being indigenous to a place and using all the resources of a land judiciously. I spoke briefly about the christening and how we had a hard time deciding if the turbine should be “christened” as a ship or having a ribbon cutting like a new structure. With great clarity, she looked at me and said – “a christening – it is a vessel of the wind.” So it is. Although it wasn’t captured on film, I did break a bottle of red wine over the foundation of the turbine and named it “Boreas” for the north wind. 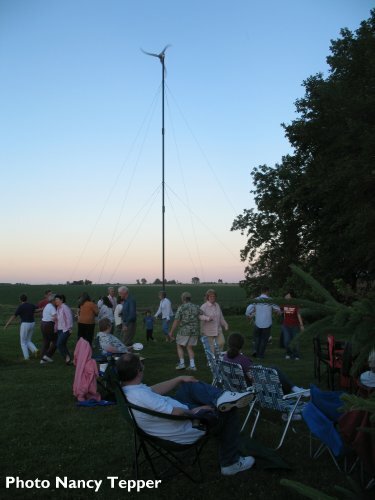 A couple of attendees gaze upward at the turbine in thought and conversation. 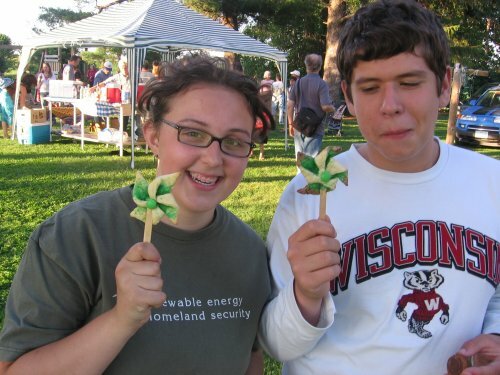 We found a recipe for windmill on a stick cookies and thought that would be appropriate for the day! 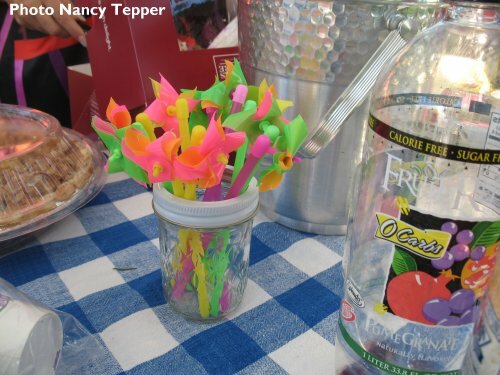 Party favors included these mini pinwheels. 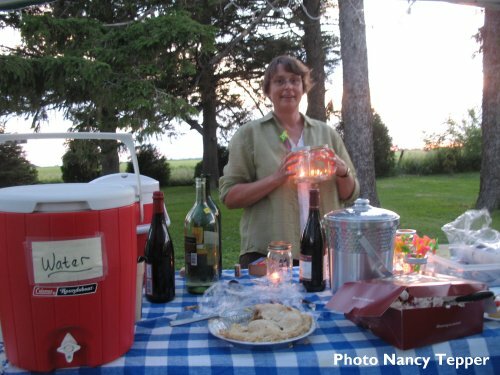 Linda readies the nighttime landscape with luminaries. 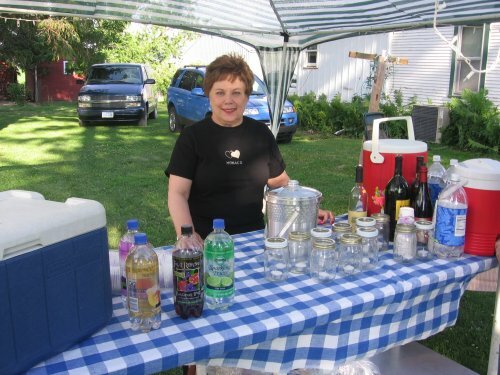 My mom tends the beverage cart with a smile! 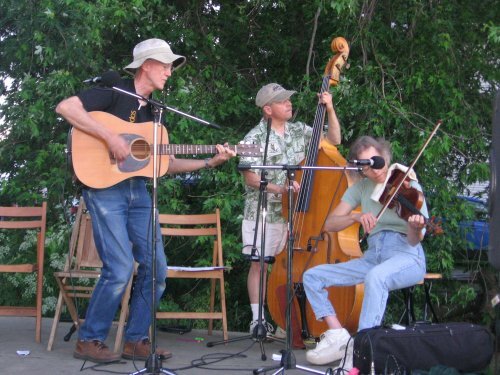 The second band (told you it was a music bash) led by neighbor Annie Grieshop. 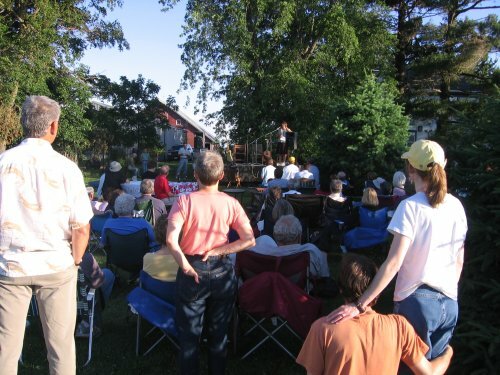 It was wonderful for people to sit and listen to the band or listen to the music blowing in the wind around the farm. A caller, gets some dancers organized into a circle for promenades circle dances under the turbine. 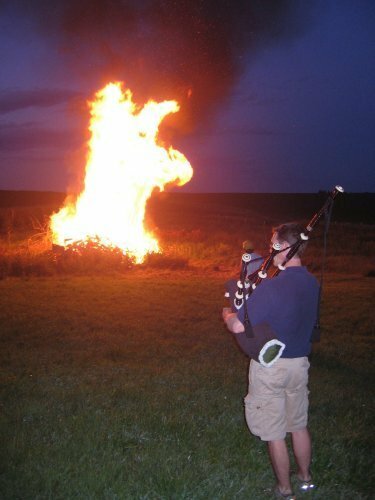 Later in the evening towards dusk the solstice bonfire was lit, preceded by a procession led by the scottish bagpipes. 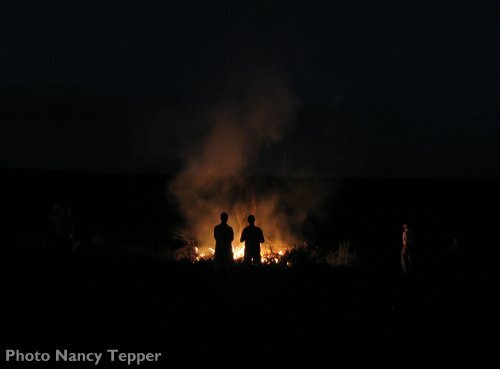 I particularly like this photo with the bonfire, people, and turbine in the background just after dusk. 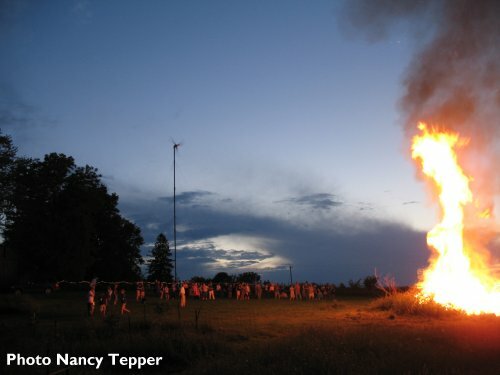 Another viewpoint of the spectacular bonfire. 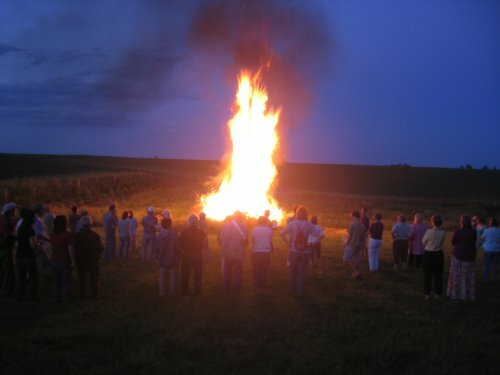 As the bonfire ebbs late in the evening a couple of people enjoy the night air and waning fire. 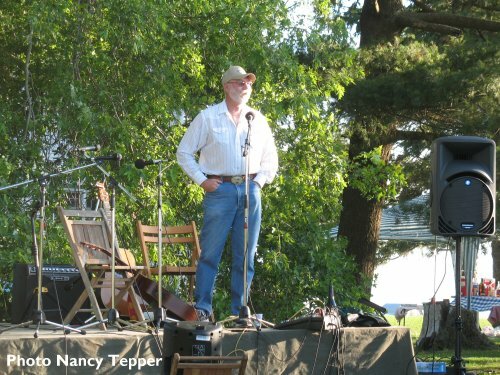 Special thanks to Nancy Tepper for being places I wasn’t and forwarding the photos to me – many of her pictures are used in this posting. This week we had a visit with some neighbors from the past. When we lived in Ames (I won’t say how many years ago) the family of “Dr Jay” lived next door with their three children. 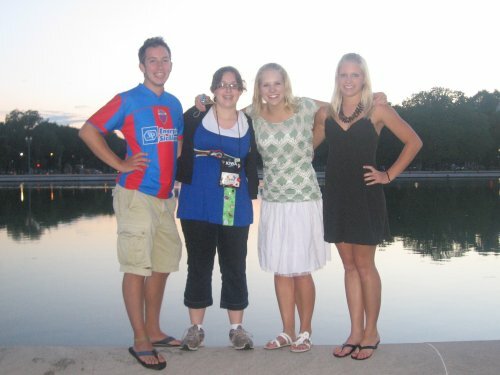 They were the first or one of the first “adult” friends we made as we transitioned from college to post-college life. 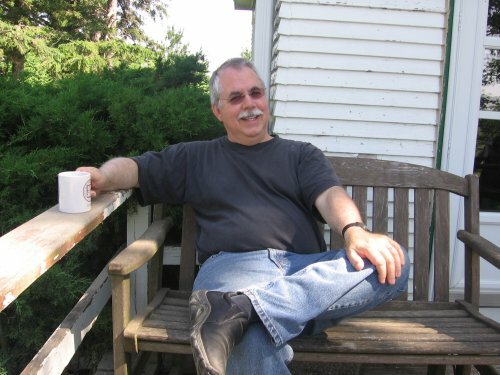 They were good for us as they had kids and a family and still were fun people to be around – a jolt for young adult who had not yet crossed over the line into parenthood. Dr. Jay, one of his daughters and two grand children were back in Iowa and spent the night. Among other things, Jay is a compulsive gatherer of firewood (I can relate) and studies pacifism in early 20th century evangelical churches. It was good to see them and catch up with them since the last time we saw them in Portland, many years ago. I had an amazing experience on this trip, both sightseeing and making new friends. It was also informative about the role of electric cooperatives, and how they serve rural consumers. 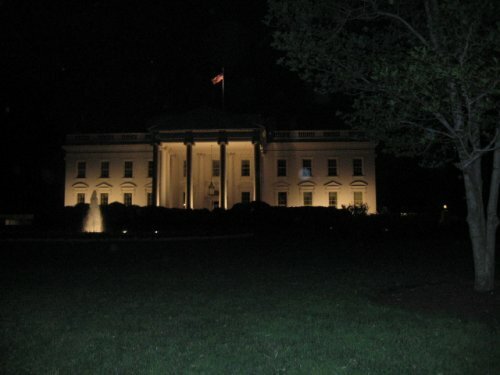 Here’s the White House, at night. There was a lot of security in D.C. It seemed commonplace to have to have to go through airport worthy security to get into any building! While on Capitol Hill, we visited the Library of Congress. I noticed a rather ominous lack of books. I’m assuming they were away from the tourist area, but that was a bit confusing! 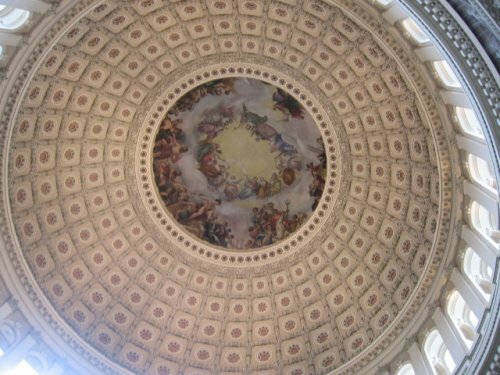 Inside the capitol, on the dome, there is painting. It’s in the style of traditional Greek mythology paintings, and it is the only painting that makes an American president into a god. 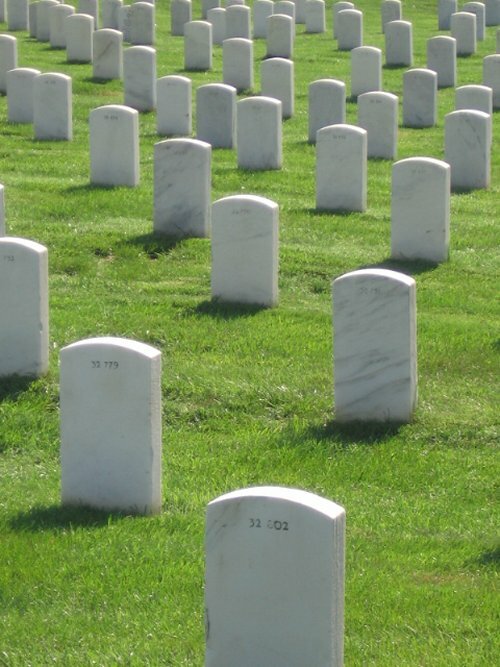 We also visited Arlington National Cemetery. This included a journey to the Tomb of the Unknown Soldier, and the Eternal Flame of JFK’s grave. 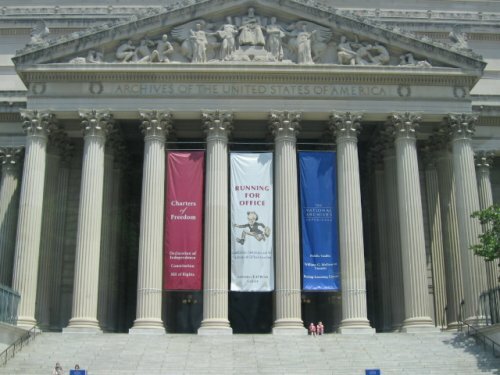 Last but not least, is a picture of the National Archives. This is where famous documents, such as the Declaration of Independence and the Constitution are held here. While on the youth tour, we saw all of the famous memorials and monuments. Here’s the Washington Monument. It was visible from everywhere in D.C. 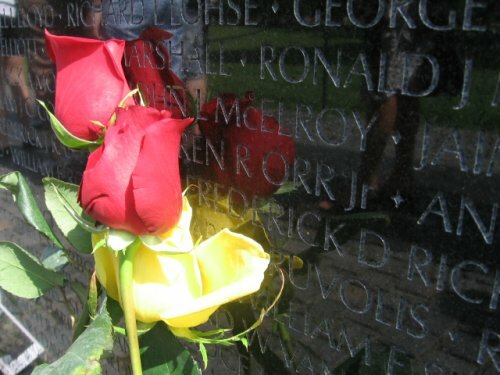 This is a close up of the Vietnam Veterans Memorial. 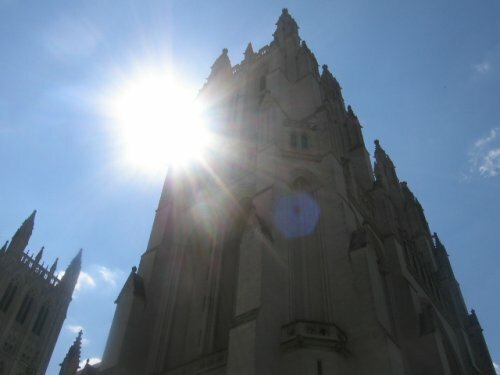 We also visited the National Cathedral. There is some beautiful stained glass there. Of course the pictures turned out nothing like the actual windows. My favorite was a window depicting the United States’ adventures in space. It is also the burial grounds of Helen Keller and Annie Sullivan. 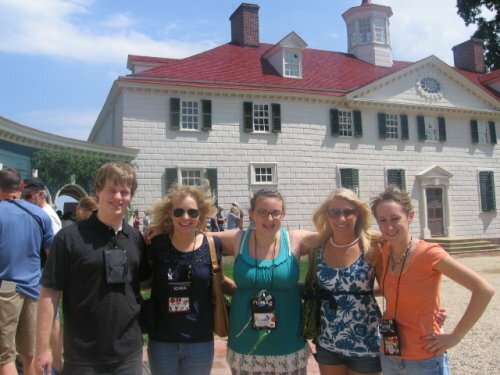 One of my favorite stops was Mount Vernon, the estate of George Washington. Here we toured his mansion, which is mostly original, with little restoration needed. We also saw his tomb, along with Martha Washington. 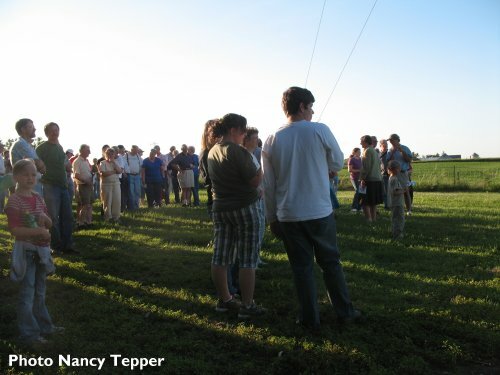 It was nice to get on to a farm like place after the busy streets and sidewalks of D.C.! 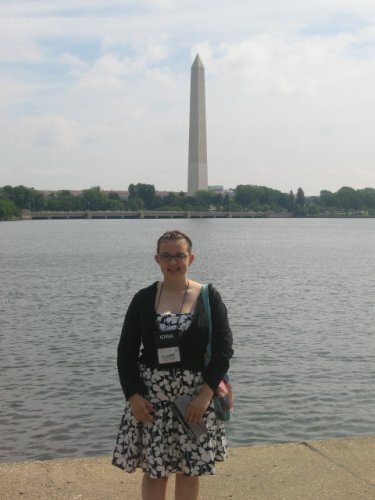 I recently had the privilege of going on an amazing and free trip to Washington D.C. The trip was sponsored by my local energy co-op, Consumers Energy (thanks!). 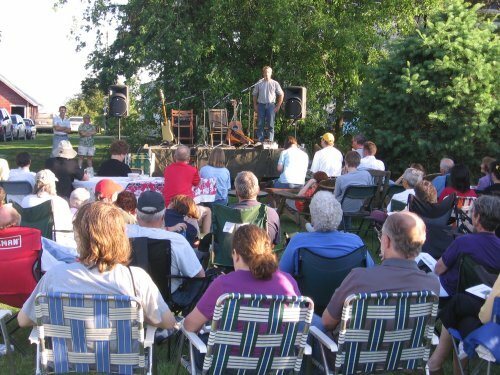 Rural electric co-ops from all over the United States could sponsor a student to go on the Rural Electric Youth Tour. There were about 43 students from Iowa traveling to D.C. It was really amazing to be able to meet people from all over the country. Every state had a different sticker or pin that you could trade, and it became a great way to meet people (in case you were wondering the Iowa sticker was an ear of corn that said “Iowa” on it). This is me and a group of Iowa friends in front of the Capitol. My favorite part of the tour was our day on Capitol Hill. We got to meet with both Senator Harkin and Senator Grassley, we discussed energy and electric issues and asked their opinions on the oil drilling bill that was currently in the Senate. 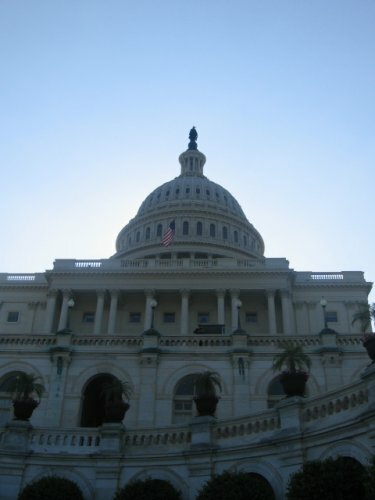 Later, we toured the Capitol, and then went and sat in the Senate, while it was in session. They were debating the oil drilling bill. As a debater, that was absolutely fascinating to me, seeing real live debating in action. While on Capitol Hill, we happened to run into Barack Obama, the democratic presidential nominee. 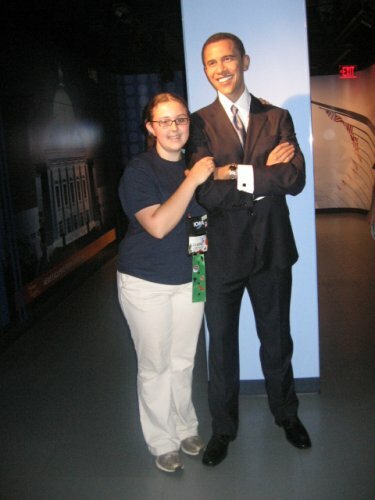 Just kidding, we went to a wax museum and there was a wax, but very realistic, statue of Obama.